Have you ever noticed how many times we cling to the known rather than risk the adventure of the unknown… even when the known is not so good and the unknown full of alluring possibilities? Security is a major issue for most of us at some level. I saw this in action recently as I watched an attempt to ‘go back’ to a place now long gone, by someone too afraid to move forward. I watched in sadness, knowing that the place that existed in memory was not the reality of that past, but an attempted escape from the present and the fears of an unknown future. I recall a conversation with my boss very many years ago, when I was about to leave the security of her home and a decent salary for an itinerant musician. We sat in the garden just outside Paris, under the stars, talking for a long, long time over a bottle of Burgundy. It was a fabulous position with wonderful people, and in a place I loved. Possibly the first time in my adult life that I had been genuinely and consciously happy. Everything I could have wished for … and I was on the verge of giving it up and jumping into unknown territory. There was no home to go to, and no real prospect of one at that time. Just a hotel room. He owned nothing but a guitar and a suitcase… I just had the suitcase, nothing more. There was no regular income, only the uncertain rewards of the music. There was, in fact, neither security nor stability in any material sense. Yet my boss put into words something I suppose I had always known but never understood. Material security didn’t matter much to me… emotional security did. She was right, though I had never seen it that way. I have thought about that a lot over the years. I had been raised in a family where there was always ‘enough’, though there was seldom more. There had been periods in my teens of truly abject poverty and near starvation, even in this civilised society… but they had been survived and had become just part of the journey. I knew from that experience how little one truly needs. Most of what we count as necessity is, in fact, luxury. I had been a child then, secure in my mother’s love, and with that security could survive anything. Years move on, perceptions change and so do we, learning from the experiences life offers, or clinging to them and stagnating. There is always that choice. I clung to emotional security for years, living in a fog of nebulous hope, even when I knew it was an illusion. Looking back at the blindness I suppose I was still seeking that security of the child who knows itself loved. In pursuit of that I forgot who I was and moulded myself to the desires of others. It is a sad way to be. When you think about it, as I did, this squeezing of oneself into expected moulds, regardless of the fit, reflects only insecurity and a lack of value of self. I had myself convinced that I had to be someone else in order to feel of value, to feel worthy of being loved. It took a long time before I understood that. We are all worthy of love, every single one of us. But we have to be able to accept that in ourselves. To see ourselves for who we are, the fragility and flaws, the rough edges of a work in progress that yet holds the perfection of the master craftsman, waiting to be realised. We are each our own Pygmalion and Galatea at the same time. Do you know that story? 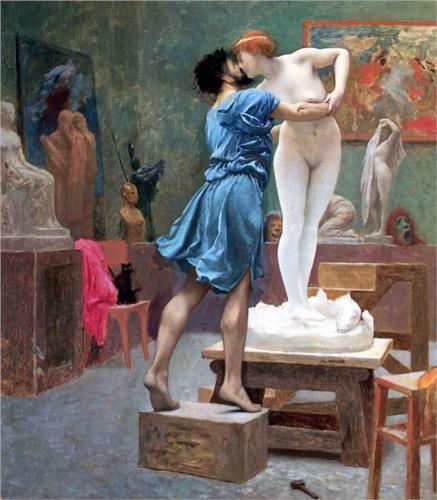 Pygmalion, a sculptor, carved a perfect woman and fell in love with her. Yet she was made of ivory, cold and lifeless. It was only when Love intervened that she was awakened with a kiss and the two united. So it is with ourselves, the outer self that moves in the world, seeking, perhaps, for something deeper, and the inner self, waiting simply for us to remember its presence and embrace it before it can waken to Life. There is a lot of spiritual and self-help stuff out there at present telling us we have to love ourselves. It doesn’t feel that simple when we have a lifetime of layers built around us, so deep, sometimes, that we forget who we are. But there is truth in it. We are each of us responsible for the surface we present to the world. Just as we are responsible for the reflection we see in the mirror of our own heart. Next time you look at that reflection, look beyond the flaws that catch your attention to the innermost core, that child of the universe, and be secure in the knowledge that this inner child is beautiful and worthy of Love. And with Love, comes awakening. Yes, and maybe that is the root of security, something within ourselves. When I was younger … even when I was not MUCH younger, I was always charging into the unknown. These days, I need my medication, a comfortable bed, and stability. Security? What’s that? I’m not sure there such a thing. It’s an illusion. I have a feeling that the only true security comes from within… and that is the ability to take each moment for what it is. We have to be bold! Yes, I believe so. It all has to begin within. what if you’re too old to be bold? Or am I merely a coward? It seems to me, the older I get, the less attached I become to things. A lot of people I know don’t seem to “get” that, themselves still striving for the material things in life. To be fair, that’s fine with me if it gives them pleasure and fulfilment. Sadly, we are in an age where the acquisition of products (gadgets, houses, cars, lifestyles) is perceived to be a meaningful goal in itself, and yet many still feel unfulfilled when they obtain those things. This post by Sue underlines where our priorities should lie. That doesn’t mean we shouldn’t want some of those “things” as well, but we’re much more likely to appreciate them if we deal with the emotional stuff first. A very true and lovely put analogy, Sue! One keeps wondering though if with the attachments clung to, part of our true vision/inner dream hasn´t been covered up, put to sleep almost…It is hopefull realizing that self-love brings healing and can unlock our ´self-made` prison. However, this process is not necessarily a painless one, considering the other analogy of the butterfly, leaving its coccoon. No, it isn’t painless for the majority of us… but, like the butterfly, it is worth it if we can earn our wings.